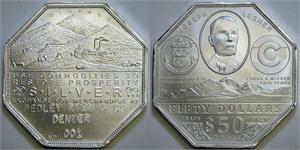 Silver advocate Joseph Lesher produced $1 and $1.25 silver tokens in 1900 and 1901 in Victor Colorado. Many were imprinted for various merchants who would accept them in exchange for merchandise. The imprints typically stated the merchant's business name and location (city, state). They circulated in Colorado and some surrounding states. Today they are sought-after rarities. 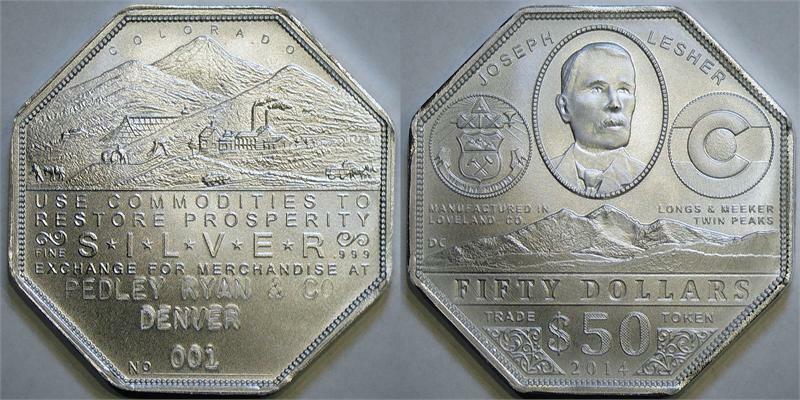 This modern Lesher $50 token is a high-quality and faithful tribute to the originals. See other product listing to order these without any imprints already applied. Order one of this product for each different imprint desired, and in the "Customer Notes" section, specify the exact desired text for the imprint and the quantity of tokens with that imprint. Two lines of text are available per imprint. Generally, the first line of text is slightly larger. Try and specify the FEWEST number of characters possible (CAPITOL LETTERS ONLY, PLUS NUMBERS, PERIODS (". "), COMMAS (","), DASHES ("-"), and AMPERSAND ("&")). Specifying too many characters may result in the use of the smallest font, or a revision to the imprint if it still won't fit. Then order any additional quantity of the lower-cost unimprinted version, and those will be given the same imprint as specified for this one. In other words, the first token with imprint is $75, and then any number of tokens after that with the same imprint are $40 each. Each token in the run will also be imprinted with a serial number ("001", "002", etc). Serial numbers start at "001" for EACH different imprint ordered. So there will be multiple tokens with the serial number "001", but they will all have a different imprint. SEE THE PRODUCT PICTURES FOR AN IMPRINT EXAMPLE ("PEDLEY RYAN & CO / DENVER" shown). We reserve the right to refuse any imprint which is deemed inappropriate or already in use. By placing an order, the purchaser affirms that their requested imprint does not violate any copyrights.